Want to track your own custom data in Google Analytics? 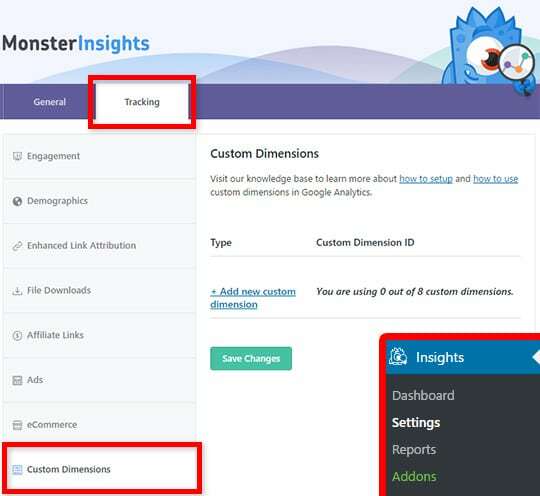 With custom dimensions, you can set your own custom tracking parameters and display it in your MonsterInsights dashboard and Google Analytics report. In this article, we’ll explain everything you need to know about custom dimensions. 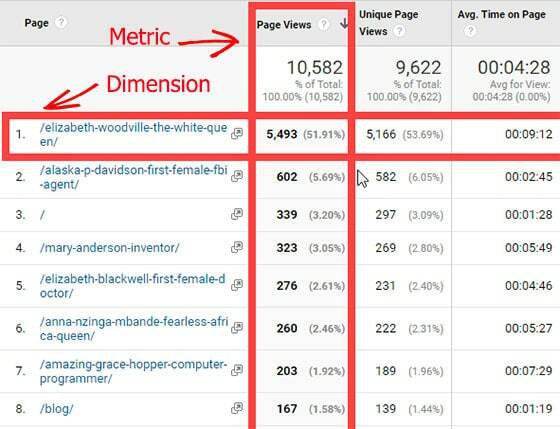 Every Google Analytics report contains two types of data: dimensions and metrics. Dimensions are attributes of your website visitors and metrics are quantitative measurements of dimensions. In a tabular report, each row represents dimension and each column represents metric. For example, gender, region, all pages, traffic sources, etc. are some predefined dimensions. Pageview, bounce rate, average time on a page are some predefined metric. 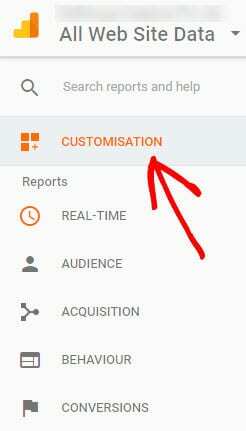 In Google Analytics, custom dimensions are just like default dimensions, except you create them yourself. Custom dimensions are greatly helpful to collect and analyze data that matter to your website, which Analytics doesn’t automatically track. The main benefit of setting up custom dimension is that it allows you to track the performance of every important element (or dimension) that matters to your website like Author, Category, Tags, etc. in Google Analytics. With MonsterInsights, you can set up the following custom dimensions. Now let’s take a look at a few possible use cases of custom dimensions in your WordPress website. 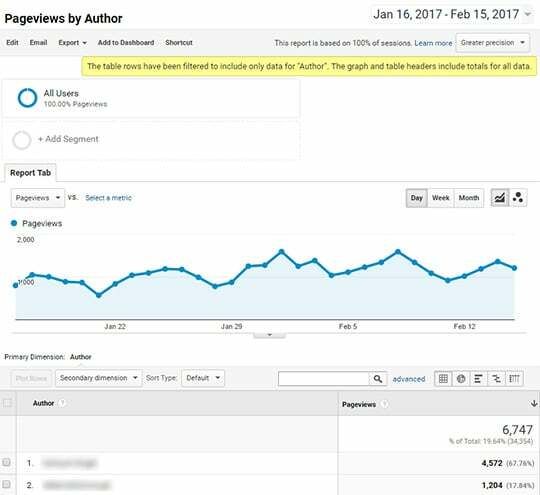 If you’re running a multi-author blog, author tracking gives you valuable insights on the performance of your blog authors. Let’s say that you’re an eCommerce store owner who wants to better track the interaction of logged in users. Since logged in users are those who matter the most to your eCommerce business, setting up a custom dimension for logged in users will give you more insights about them that you may have otherwise missed. You can track the most popular products amongst your logged in users by gender. This data can help you to personalize the shopping experience of your customers. You can get a detailed report of each and every logged in users like their purchasing behavior, what product category they’re interested in and more. Custom dimensions give you endless possibilities to track important elements that matter to your website and online business. You can add Post Type tracking to see which one of your WordPress post types perform better. You can add SEO Score tracking to see which blog posts are the most popular. You need to set up custom dimensions both in your WordPress website and Google Analytics account. Let’s walk through the whole setup process step by step. Without MonsterInsights, setting up custom dimensions on your site can be tricky and time-consuming especially when you’re not tech savvy. MonsterInsights makes it easy to set up custom dimensions on your WordPress site in just a few clicks, without having to touch a single line of code. To be able to set up custom dimensions on your site, you’ll require the MonsterInsights plugin and the Custom Dimensions addon (available to Pro level users and above). 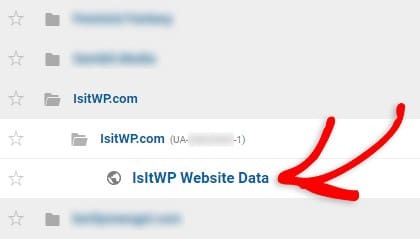 First off, install MonsterInsights on your site and properly authenticate it with Google Analytics. Next, you’ll want to install the Custom Dimensions addon. To install the addon, visit the Insights » Addons page in your WordPress dashboard. 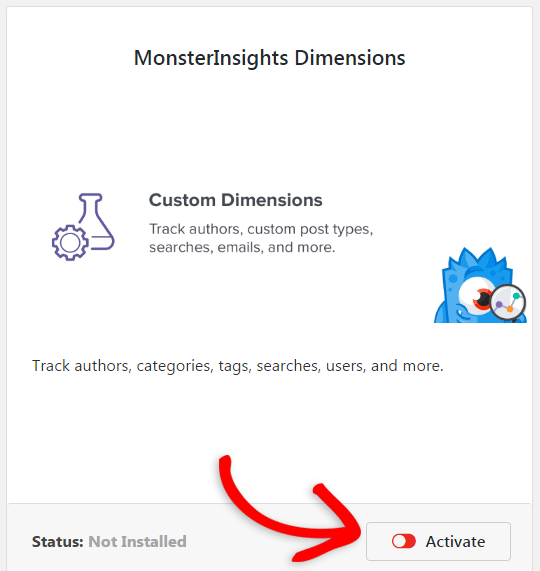 Then, click Install under the MonsterInsights Custom Dimensions addon. After installation is complete, the button will change to say Activate. Go ahead and click the Activate button to make sure the addon is active and ready to use. Navigate to Insights » Settings. Now click on the Tracking tab on the upper tab row, and then to the Custom Dimensions tab on the left tab row. Now click on Add new custom dimension. You can choose from many dimensions. Once you are done selecting, click the Save Changes button. Now that you’ve set up Custom Dimensions on your website, the next step is to set them up in Google Analytics as well. To get started, you can log into Google Analytics, and select the website in which you’d like to set up custom dimensions. You’ll see a table where you can click + New Custom Dimension. Click on it. Now you can fill in the name of your new Custom Dimension and click Create. You don’t have to change any of the other settings. 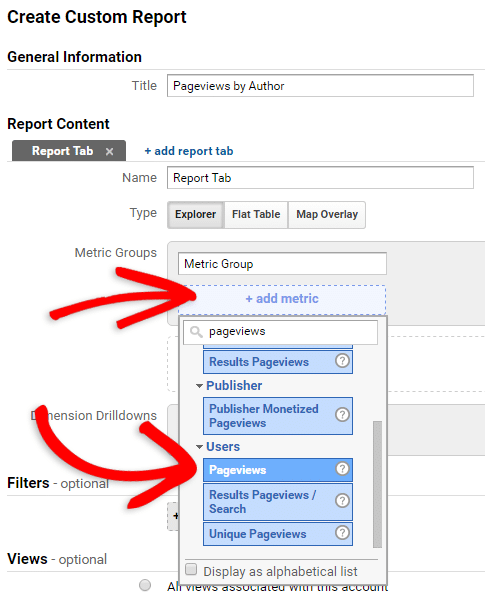 In Google Analytics, you can find custom dimensions report in two ways. 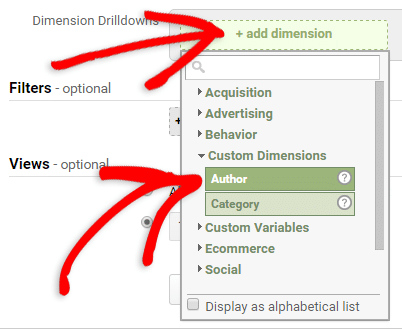 This is probably the easiest way to find your custom dimensions report in Google Analytics. All you need to do is to add a secondary dimension to your standard report. We’ll walk you through how to do this below. you want to label your custom dimension as the primary dimension. you want to add more than two dimensions (custom reports can have 5 dimensions) per row. The standard report allows you to use only two dimensions. Let’s take a detailed look at how to find custom dimensions, step by step. First off, you’ll need to log in to your Google Analytics account, and select the website you’d like to find your Custom Dimensions report in. For the sake of this example, let’s add a custom dimension as a secondary dimension to your All Pages report. In the left panel, choose Behavior » Site Content » All Pages. Now you’ll see a standard All Pages report in Google Analytics. You can find a button labeled Secondary dimension just above the table. 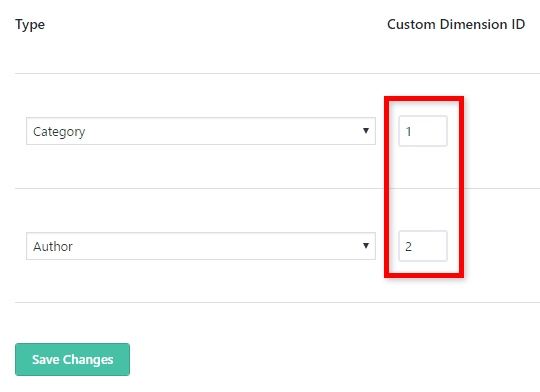 Click on it and choose your preferred custom dimension by clicking on the Custom Dimensions dropdown menu. The report will look like this. See the below screenshot. The same way, you can add a custom dimension as a secondary dimension to any other standard report. 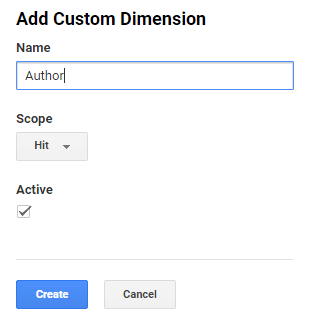 Log in to your Google Analytics account, and select the website you’d like to find your Custom Dimension reports in. Then, click the Customization / Customisation tab in the left panel. 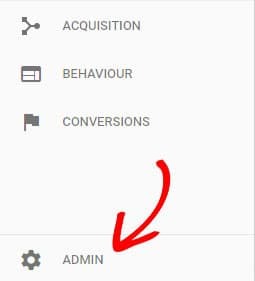 You can now click the + New Custom Report button. Now you’ll need to tell Google Analytics what to include in your report. 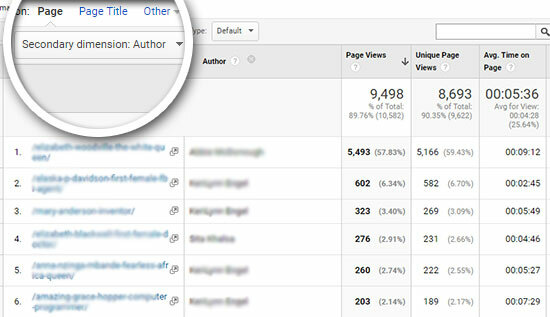 In this guide, we’ll create a report to show us the number of pageviews by author. We named our report Pageviews by Author. Under Metric Groups, click the + add metric button. Type pageviews” in the search field. Then click on the Pageviews metric under the Users heading. After that, you can click the + add dimension button and then click Custom Dimensions to specify the Custom Dimension you want to report. When you’re done, click the Save button at the bottom. That’s it! Now you’ll be redirected to your new report. Now you can access it at any time by navigating to Customization » Custom Reports » Pageviews by Author. Custom dimensions report gives you detailed insights on the dimension you choose that you may have otherwise missed. You can make use of these data to improve the user experience, engagement, conversions and revenue of your online business. 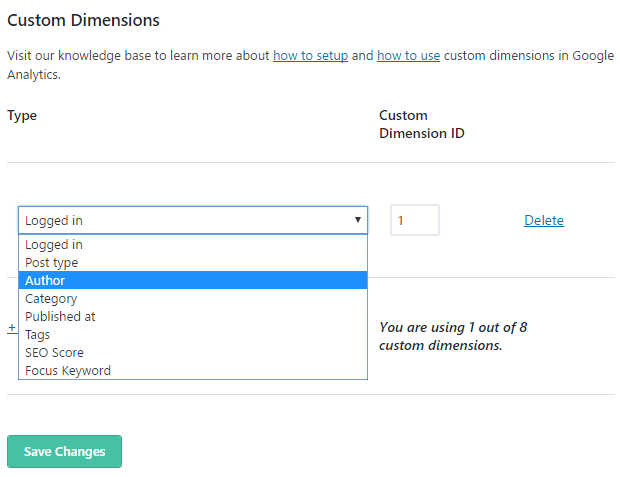 With MonsterInsights, you can set 8 types of custom dimensions. 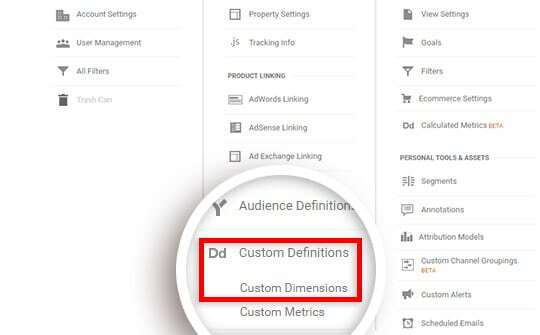 Below are a few tips to use the custom dimensions report in Google Analytics based on them. For example, if you’re an eCommerce shop owner, you can gather more insightful data about your logged in users to identify what works best for them. You can create custom reports by choosing your custom dimension as primary and two or more predefined dimensions (like gender, traffic source or other eCommerce data) as secondary. This way, you can personalize the shopping experience of your customers based on their gender and other dimensions. You can get detailed insights about the visitor interaction, preferences of logged in users of a membership site by setting User ID as a custom dimension. This way, you can customize the user experience of your membership site. For example, imagine that you run a review site in which you review several categories of products. If you define each product category as a custom post type, you can track how users interact on each category and gather valuable data about it. If you run a multi-author blog, you can identify what works best for each author. It helps you to curate future blog post ideas for each author and restructure your content marketing strategy based on it. Tracking the performance of different categories of your site is another great strategy to identify what works best. This data can be helpful to save your time and money. For example, you can stop spending time on a category that your visitors are not interested in, and invest your time and money for the ones that work best. Do your latest articles gain traction among your audience? For example, if most of your popular content was written years ago, it reveals that your latest articles are not gaining enough traction among your audience. In that case, you can focus on writing great content and promote your latest articles in your niche. Unlike Categories, Tags give you more detailed insights about what works best on your site. It also helps you to come up with future blog post ideas for your site. If you’re using the Yoast plugin for SEO, you can analyze the SEO score of your posts and pages in Google Analytics. It helps you to identify if SEO scores really matter and how these scores influence your organic traffic. You can get a data-driven report based on your SEO scores, which help you restructure your SEO strategy for improving organic traffic. This is another custom dimension you can set for your site. It is also applicable only if you’re using the Yoast plugin for SEO. The Yoast plugin requires you to set a focus keyword for every post. You can identify what focus keywords are driving more organic traffic and get data-driven insights about choosing focus keywords for boosting organic traffic. We hope this guide helped you to get some insights about creating custom dimensions in Google Analytics. If you liked this article, you might want to check out our guide on creating a goal to track conversions in Google Analytics. And don’t forget to follow us on Twitter and Facebook for more Google Analytics tutorials.